Ken Chandler, driver of the Project Filter Smoke Free 33 Corvette was the 2013 Meridian Speedway Pro4 championship points’ runner-up with 5 feature event wins in the 13 race Meridian Speedway schedule. Ken scored five trophy dash victories and reestablished himself as the Pro4 track record holder at a lap of 13.964. 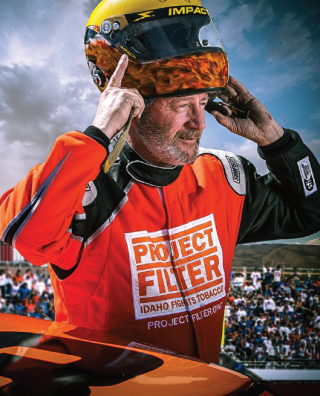 Ken’s Project Filter Smoke Free 33 also races at Magic Valley Speedway in Twin Falls for the Project Filter 75 event a Northwest Pro4 Alliance Tour race. There, he finished 8th in a field of the best Pro4 cars in the country. While in Twin Falls, Project Filter took part in The Snake 98.8 Radio remote where Ken shared information about how the visiting fans could pick a quit date and end their dependence on tobacco. Ken also made appearances at the Canyon County Fair and gave talks on what prompted him to take the step to end his dependency on tobacco.